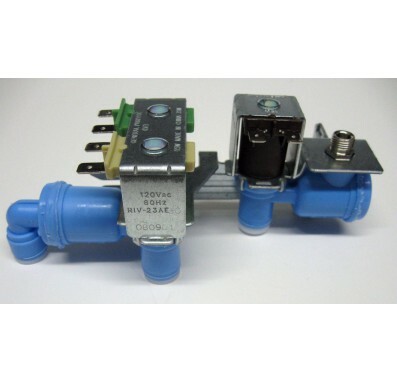 The Electrolux 241734301 / 242252702 is a triple solenoid water inlet valve used on many refrigerators. If your water dispenser or icemaker fail to work properly, it may be caused by a defective water inlet valve. With a pliers and a screwdriver nearly anyone can replace this unit. The Electrolux Refrigerator Icemaker Water Valve is a very common replacement part for Electrolux, Kenmore, Frigidaire, Gibson, Crosley and other brand refrigerators. Color coded valves for intuitive replacement. Quick connect fittings for ease of replacement.